Gwyneth Rollin holds a B.Mus. from the University of Calgary in violin performance along with a M.Mus. and Ph.D. from Indiana University in music theory. She studied theory with Robert Shallenberg and Vernon Kliewer; composition with Roque Cordero, Bernhard Heiden, and Iannis Xenakis; and ethnomusicology with Walter Kaufmann. Dr. Rollin has performed several concerts in the Chicago metropolitan area, and her guest-lectures there have examined such topics as string music and contemporary music analysis. Her current activities include analysis of works by Ginastera and research on international music styles and practices. She is a professional music calligrapher, editor, and expert on computer notation. 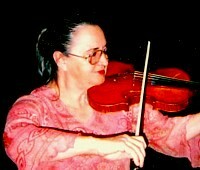 Her original compositions are published by Acoma/Nambe Editions. As a solo violinist, Dr. Rollin has performed in schools for Jeunesses Musicales of Canada. She has also been a member of the National Youth Orchestra of Canada, the Calgary Philharmonic, and the Banff School of Fine Arts Orchestra. Premiering many new works for violin, including the Violin Concerto of Robert Rollin (with the Guadalajara Symphony in Mexico), she has toured in the U.S. and Canada with the Gwyneth Rollin-Lynn Harting Ware violin and guitar duo, and with her husband, pianist Robert Rollin.